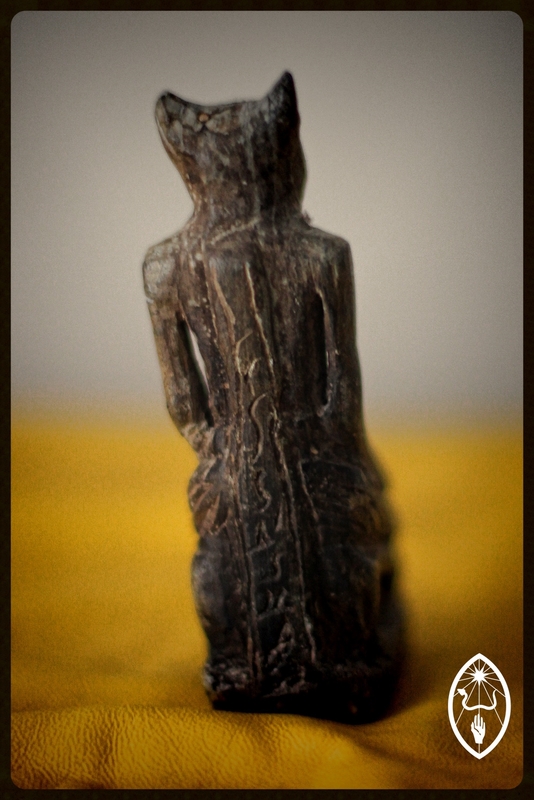 "This small figurine was acquired as a gift from an old member of the 'Wynn Westcott Society'. I had been visiting his house in my capacity as a book dealer, there to tender a bid for his rather sizeable occult book collection, which I then subsequently bought. - The book collection was kept, not only in his basement, but through a concealed door into a second subterranean cavity - nice and dry and cool. It was mostly G.D. and early Crowley stuff, with plenty of Rosicrucian and Freemasonry thrown into the mix. Following a discussion when I came to collect the books he handed me this small figurine saying simply, 'I want you to have this'. The figure is a small (84mm) alabaster figure of Egyptian design. The surface of the alabaster has aged and oxidised considerably with dust strewn cobwebs filling the cavity between base and shins. There is some slight damage to the front of the face/muzzle, a chip to the top left ear, and a small crack down the middle of the face. The figurine seems to depict a male cat/dog (?) headed individual. The torso is unclothed, while the hands resting on the skirt covered legs both feature fore fingers pointing forwards. Hieroglyphics adorn the back spine plate which I have not been able to discern. There are surprisingly few cat-headed deities, particularly that take on a male gender. Certainly there a few lion-headed male deities. Realistic provenance? It is very crudely executed which does not help the case for its authenticity. Having travelled Egypt and sought out the rather scarce purveyors of Egyptian artefacts and replicas carved in stone - rather than the ghastly resin cast duplicates that swamp the country - this looks to be of a similar standard to other alabaster figures I have picked up. However, the apparent ageing of the alabaster is so severe that it goes far beyond the usual ageing one would expect to see in the knock-off replica market, even in Egypt. My conclusion is that it is a modern antique - could be 50 or 100 years old - rather than a true Egyptian antiquity. If anyone has any ideas or can identify it, please contact me via the website.